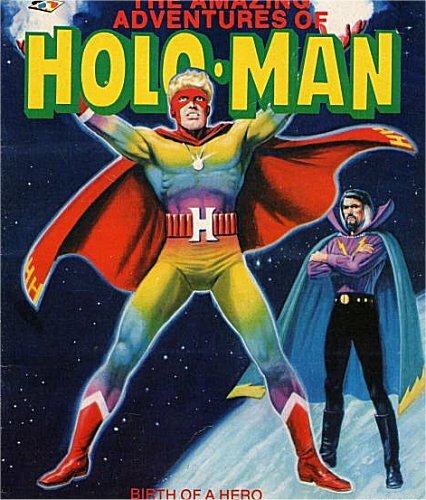 Powers/Abilities: As Holo-Man, Robinson can do all the usual stuff associated with later holographic characters (illusions, invisibility, walking through walls). History: Scientist James Robinson was accidentally transformed into a living hologram while saving President Jimmy Carter from an assassination attempt by Surrian agents. Robinson is given his identity as Holo-Man by an entity which identifies itself as Laserman. Shortly afterwards Surria launches an invasion of the US, spearheaded by holographic missile strikes. Holo-Man and the other members of the Holo-Squad oppose this offensive. Comments: Thanks to Mike Harwood for informing me of this character, and providing both the information used above and the images on this page. Mike also mentions that the Surrians, in a fit of Cold War paranoid writing, all call each other "comrade", that Laserman "looks suspiciously like the wizard Shazam", and that "The Amazing Adventures of Holo-Man Vol 1, Number 1 ends on a note of Cold War paranoia as Surria launches an invasion of the US, spearheaded by holographic missile strikes. Presumably Holo-Man's resolution of this problem would also have introduce his associates in the Holo Squad. I'm guessing that the unidentified character in the background on the cover would have been a villain." 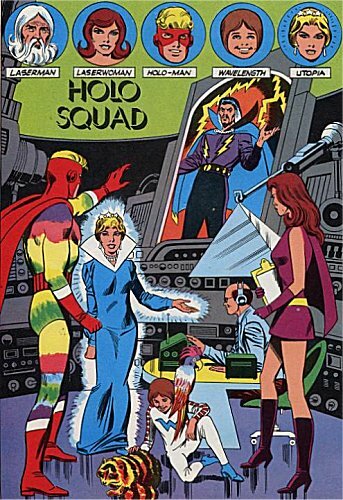 An image in the issue shows Holo-Man with the above named group, who don't actually appear elsewhere. Presumably if the title had continued he would have teamed up with them. As it is, we are left only with an intriguing look at the team that might have been. Lastly Mike mentions "The adverts for the book are fondly remembered (see here)"
The Hollow Man, Sebastian Caine (Kevin Bacon), an invisible psychotic in the movie of the same name.